The SBK fixed blade is the design of Sebastijan Berengi of Borka Blades produced by Microtech Knives. 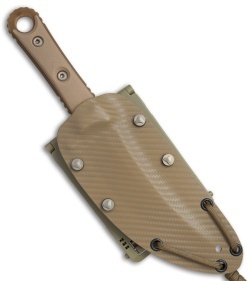 It's a fabulous combination of talent and the finished result is exquisite in all its particulars. 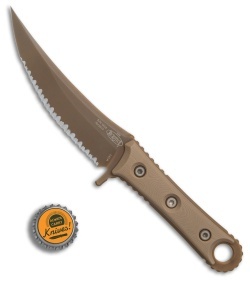 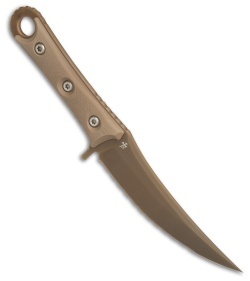 This model features a fully serrated Bohler M390 blade with a tan PVD finish and tan G-10 handle scales. Bohler M390 stainless steel blade for exception cutting performance. Ergonomic G-10 scales and ample jimping provide a secure grip. 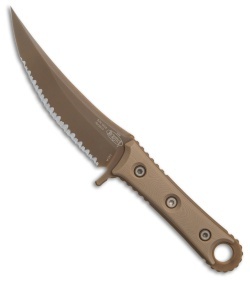 Rounded spine and full-tang handle for added comfort and durability. Carbon fiber pattern Kydex sheath with Blade-Tech attachment clips.